Human Bite is a puncture wound inflicted by contact with the teeth and mandibular force from another human. It is generally a dangerous condition, with even minor ones having the potential for severe infection, if left untreated. What are the Causes of Human Bites? What are the Signs and Symptoms of Human Bites? 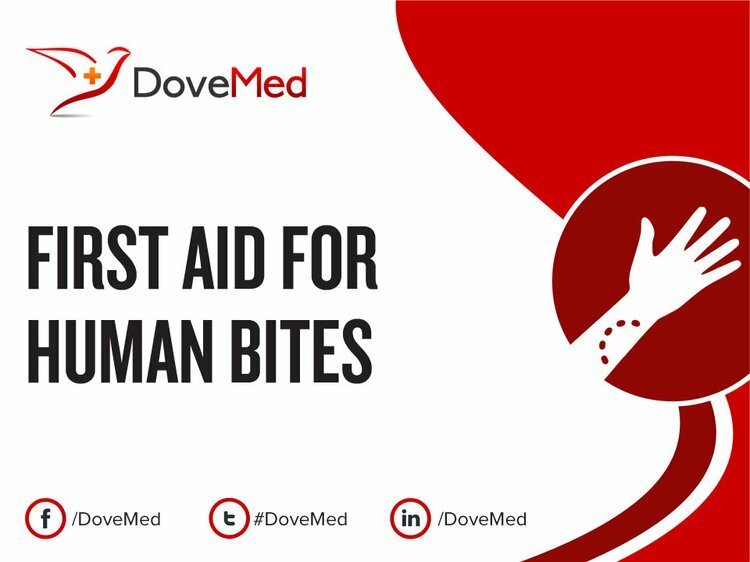 How is First Aid administered for Human Bites? For infected Human Bites, parenteral therapy (intravenous antibiotic therapy) is necessary. In cases, where the infected wound (skin/soft tissue) is associated with infection of the underlying bone (termed osteomyelitis), intravenous antibiotic therapy may be required for 6 weeks. Who should administer First Aid for Human Bites? What is the Prognosis of Human Bites? The prognosis is dependent on the extent and severity of the bite, but is usually good with appropriate treatment. How can Human Bites be Prevented? Lohiya, G. S., Tan-Figueroa, L., Lohiya, S., & Lohiya, S. (2013). Human bites: bloodborne pathogen risk and postexposure follow-up algorithm. Journal of the National Medical Association, 105(1), 92. Tak, S., Sweeney, M. H., Alterman, T., Baron, S., & Calvert, G. M. (2010). Workplace assaults on nursing assistants in US nursing homes: A multilevel analysis. American journal of public health, 100(10), 1938-1945. Kennedy, S. A., Stoll, L. E., & Lauder, A. S. (2015). Human and other mammalian bite injuries of the hand: evaluation and management. Journal of the American Academy of Orthopaedic Surgeons, 23(1), 47-57. Rothe, K., Tsokos, M., & Handrick, W. (2015). Animal and human bite wounds. Deutsches Ärzteblatt International, 112(25), 433. Tognetti, L., Martinelli, C., Berti, S., Hercogova, J., Lotti, T., Leoncini, F., & Moretti, S. (2012). Bacterial skin and soft tissue infections: review of the epidemiology, microbiology, aetiopathogenesis and treatment. Journal of the European Academy of Dermatology and Venereology, 26(8), 931-941. Bruce-Chwatt, R. M. (2010). A brief history of forensic odontology since 1775. Journal of forensic and legal medicine, 17(3), 127-130. Godara, H. (2013). The Washington manual of medical therapeutics. Lippincott Williams & Wilkins. Tosti, R., & Ilyas, A. M. (2010). Empiric antibiotics for acute infections of the hand. Journal of Hand Surgery, 35(1), 125-128.